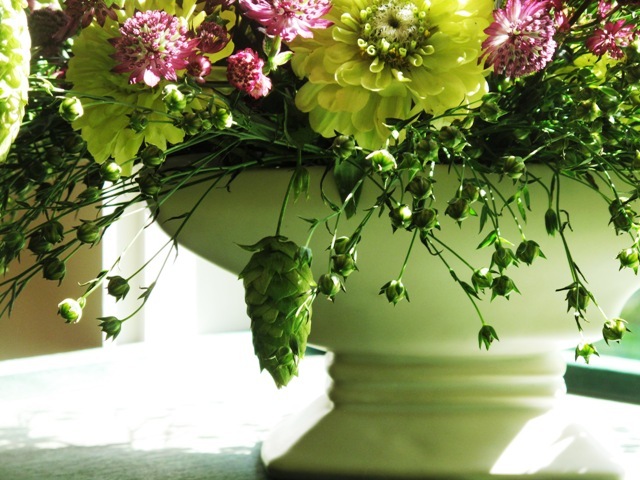 Humulus lupulus, common hops, a dangly little element that adds character to any arrangement. 20 stems perennial flax (Linum perenne), grown by Charles Little & Co. The hops plays nicely with the zinnia, astrantia and perennial flax. 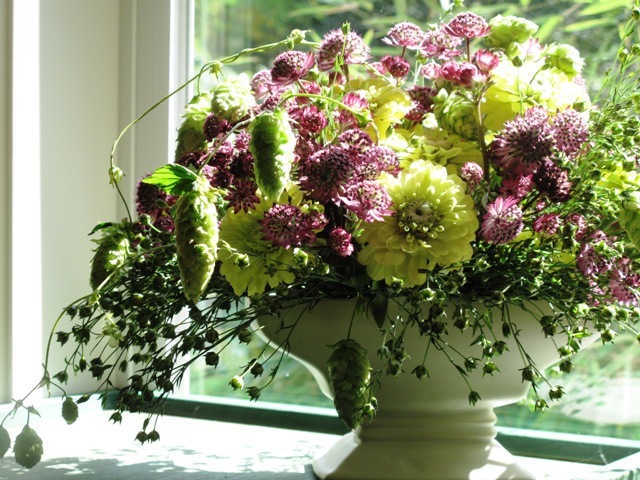 Instant gratification: I had been waiting all summer to use hop vines and their dangling green cones in an arrangement. These stems came from Oregon. Floral designers love the dreamy, 18-foot-long hop garlands, often using them to decorate wedding arbors. Common hop is also used by home brewers. With fast-growing, twining stems, hand-sized lobed leaves and bract-like flowers, the female form of Humulus lupulus is also a “quick” screen for a fence, wall or trellis. It does, however, need to be cut back once a year (usually in late fall, after the first frost), in order to produce a new flush of vines the following season. This entry was posted on Sunday, September 8th, 2013 at 6:56 am	and is filed under American Grown, Creativity, floral design, Gardening, General, Plants, Slow Flowers: 52 Weeks, Writing. You can follow any responses to this entry through the RSS 2.0 feed. You can leave a response, or trackback from your own site.